Will Seadrill Limited Bring Back Its Dividend in 2017? After suspending the dividend three years ago, could the offshore driller finally reward income investors for their patience? The energy industry has gone through tough times in recent years, and Seadrill (NYSE:SDRL) has been among the hardest-hit companies in the sector. After having taken maximum advantage of favorable conditions in the oil market by building up an impressive fleet of offshore drilling rigs and equipment, Seadrill found itself having to deal with plunging crude prices that led many of its customers to cancel or delay drilling projects offshore. That forced the company to suspend what had been an extremely lucrative dividend, disappointing income investors. Yet now that oil prices are bouncing higher, some hope that Seadrill might be able to bring back dividends at some point in the future. Let's look more closely to see how realistic it is to expect Seadrill to consider restoring its dividend this year. Source: Yahoo! Finance. Last dividend refers to ex-dividend date. Until a couple of years ago, Seadrill had worked hard to build up a reputation for strong dividend growth. The company started out paying a $0.25 per share dividend in early 2008 and then quickly boosted it by more than double to $0.60 per share. The financial crisis in late 2008 led Seadrill to suspend payments for a year, but the company came back strong in late 2009, with dividends that started at $0.50 per share and worked their way higher over the years. 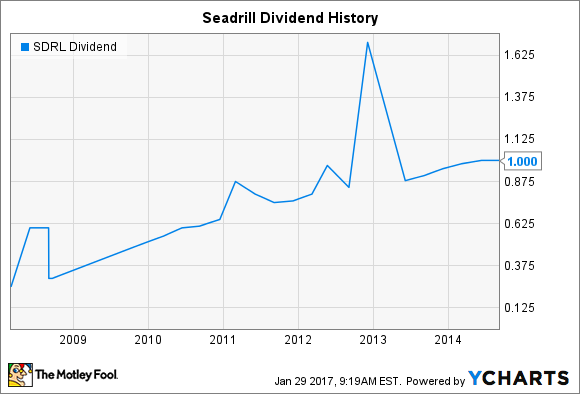 A few special supplemental dividends also added to the amount of income shareholders got from Seadrill, which you can see as spikes in the graph below. The problem, though, is that all the growth that Seadrill produced came from taking on massive amounts of debt. By late 2014, Seadrill had accumulated more than $13 billion in long-term debt, and the offshore drilling equipment specialist was facing massive newbuild installment payments and debt repayment obligations. That led the company to suspend its dividend distributions, with the intent in Seadrill's words being "focusing on debt reduction and value creating opportunities due to significant deterioration in the broader markets." Unfortunately, the crude-oil price drops in late 2014 turned out to be just the tip of the iceberg for the energy industry. Plunging prices throughout 2015 led to even more damage for the offshore drilling industry, and Seadrill had to respond by delaying and cancelling its plans for newly built vessels. Will Seadrill ever pay a dividend again? Since then, Seadrill has made incremental progress, but it's far from out of the woods just yet. Sales of non-core assets helped the drilling-rig specialist reduce its debt somewhat, and negotiations on refinancing and extending its existing debt gave Seadrill more time to hope for a recovery in the markets. Yet even though cost reductions have been successful, it's unclear how much more there is to cut. Looking forward, Seadrill has more work to do. The company wants to renegotiate the debt it has coming due over the next three years, but it has more than $3 billion in debt to deal with in 2017 alone. Seadrill says that it's close to a refinancing deal that could push maturities further out to between 2020 and 2023, giving it the time to wait for a broader oil price recovery and renewed interest in drilling. However, when it comes time to renew contracts on its fleet, Seadrill has to expect lower prices, and that could further challenge its ability to pay down debt. For 2017, Seadrill investors should not expect the company to restore its dividend. However, shareholders should get a lot of valuable information this year regarding Seadrill's longer-term prospects. If it can set the stage for a stronger future, then Seadrill could put itself in position to restore dividends eventually -- once its debt is under control and higher oil prices support contract-price increases.